In the last decade, the sales cycle has become increasingly complex for B2B marketers. Prospects are spending more time online today as traditional B2B marketing channels, such as direct mail and industry magazines, become old hat. According to eMarketer, Americans spend 23+ hours a week on email, social media and texting. As a result, they have greater access to information about business solutions, and they’re spending more time researching your products and services before reaching out to your sales team. 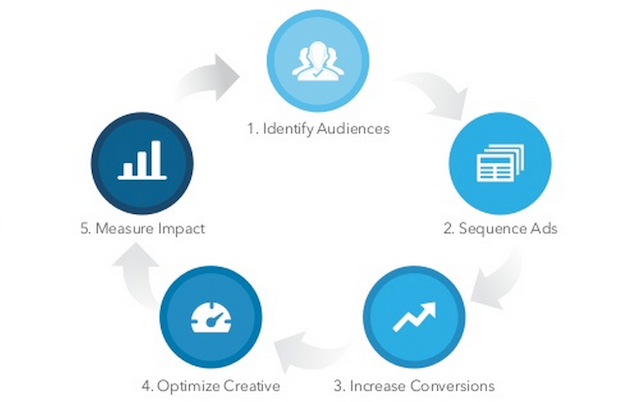 Simply put, buyers control the B2B marketing funnel. In fact, Forrester Research notes that prospects are anywhere from two-thirds to 90% of the way through their buying journey before contacting a vendor. To regain some of that control, B2B marketers need to reach targets earlier in the buying process. With more than 364 million members worldwide—including 7.9 million business decision makers—LinkedIn is the perfect platform for a full-funnel marketing approach. Here’s how the social network can help your brand reach that goal. Traditionally, branding and awareness haven’t been at the forefront of B2B marketers’ campaigns. Instead, they tend to favor a more direct-response approach through mail or email. The problem with this is that by focusing on lower funnel leads, they’re ignoring a larger subset of people who aren’t currently looking for their products or services. Here are a few of the features available through LinkedIn that you can use to extend your reach in this important stage of the sales cycle. Keep your company’s brand and content in front of target audiences throughout the buying process with LinkedIn Display Advertising. 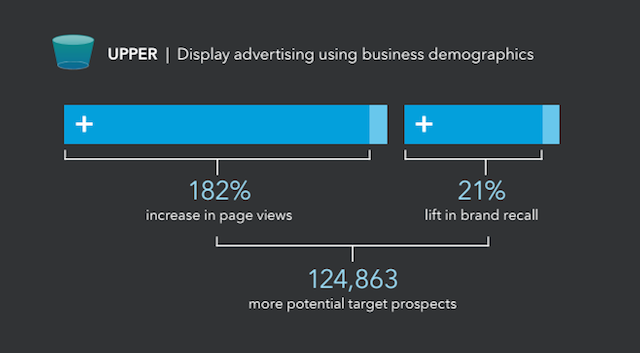 Display ads can increase awareness and engagement for your business on LinkedIn and across the web through LinkedIn’s 2,500 publisher sites. 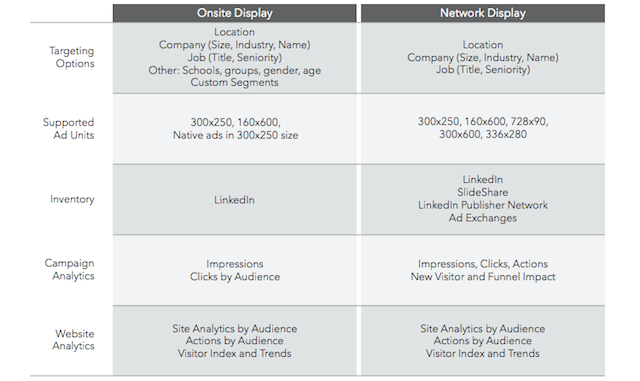 Use Onsite Display to create brand awareness with more than 364 million professionals on the LinkedIn network with IAB-standard ads as well as formats unique to LinkedIn, such as Follow Company Ads, Spotlight Ads and Join Group Ads. From there, keep professionals engaged with Network Display. This allows you to identify specific groups of people—for instance, IT professionals from Chicago—and use Internet cookies to continue advertising to them even after they’ve left LinkedIn. After launching your ad campaign, build relationships with professionals through high-quality content. Reach prospects where they’re most engaged, using Sponsored Updates, which allow you to publish relevant content directly to the homepage feed of any member, not just your Company Page followers. You can drive even more leads by delivering relevant content in the most personal way possible on LinkedIn: right to members’ inboxes. Sponsored InMail gives you the ability to send an email message to any member. Reach members when they’re active on the site and turn recipients into customers. We’ve covered both of these LinkedIn lead generation features more in depth in our Complete Guide to LinkedIn Ads. The top of the funnel is where you convey what your company does, why your products are unique and why people should care about your business. In the lower funnel, your goal is to nurture and educate prospects—at this point they’re aware of your brand, but they’re not necessarily ready to engage with a sales representative. Nudge prospects toward conversions by providing them with tools and resources that teach them about your business solution. This can be achieved through search, gated content, webinars, social media advertising, email marketing and LinkedIn’s Lead Accelerator. By building awareness and developing relationships with prospects early on in the buying process, at this point, you’re likely to have a group of highly targeted people ready to convert. Let’s take a closer look at how LinkedIn’s Lead Accelerator contributes to your success in the lower funnel. 95% of website visitors leave without providing an email address. 80% of marketing emails go unopened. Lead Accelerator solves both challenges by going beyond traditional email nurturing, using display and social advertising to nurture both anonymous and known prospects anywhere they travel online, across multiple devices. Identify and target your highest-value audiences, both anonymous and known. Sequence relevant messaging based on the profile and onsite behavior of your prospects across display and social ads as well as Sponsored Updates. Increase conversion rates with LinkedIn’s autofill capability. Optimize ad creative and nurture stream design through platform-supported A/B testing. Measure program impact at every stage of the buy process through built-in reporting. There are two different website audiences: one that visits the homepage and leaves, and the other that dives deeper into product pages. The latter is more sales ready, but both audiences are valuable. Lead Accelerator lets you nurture both groups with the most relevant messaging and content—moving members of the first group into the second. Now that you have a better understanding of what Lead Accelerator is, here are some examples to draw inspiration from. eCornell, a subsidiary of Cornell University, is active across multiple marketing channels, because the decision to enroll in one of its certification programs takes time. The organization receives a lot of traffic to its homepage and uses Lead Accelerator to leverage the value of that audience. Rather than wait for them to return and dig deeper, eCornell uses Lead Accelerator to nurture them with a series of offers about specific areas of its catalog of programs across Facebook News Feed and LinkedIn. “This makes it easy for prospects to engage with the programs that they’re most interested in,” Hickey said. As a result, landing page conversion rates were twice as high as normal marketing campaigns, and cost per lead was three times lower than what eCornell saw through retargeting. For more insight into eCornell’s campaign, read through Hickey’s 5 Things to Know Before Launching Your Lead Accelerator Program. Enterprise software company Zuora brilliantly adopted a full-funnel marketing strategy, and it’s paid off. Using display advertising and business demographics to target professionals at the top of the funnel, Zuora saw a 182% increase in page views and a 21% lift in brand recall. Combined, that translated to 124,863 more potential targets who are aware of Zuora. In the lower funnel, the company used display creative with specific calls to action to view content on its website, such as product pages and demos. People exposed to these ads were 42% more likely to view multiple web pages and invest additional time on Zuora’s website. In total, the brand’s full-funnel marketing strategy led to more than 1,000 new conversions, created a 21% boost in brand awareness and increased page views by more than 180%. According to software company Workfront, more than 96% of its website visitors leave without converting. “In B2B you can’t expect most of your anonymous visitors to convert on their first visit to the website,” Micah Beals, Director of Digital Marketing at Workfront, told LinkedIn. Using Lead Accelerator, the company nurtured prospects with waves of LinkedIn Sponsored Updates, Facebook News Feed and display ads. Armed with website navigation, anonymous visitors’ business demographic data and more, Workfront developed a variety of customized nurture streams for different audience segments. For instance, after visiting and leaving the solutions page on Workfront’s website, IT professionals would see sequenced ads related to tech solutions for several weeks, while non-IT visitors would see a different set of ads. In just three months, Workfront generated more than 640 leads through the Lead Accelerator at a cost well below its cost-per-lead targets. LinkedIn Lead Accelerator is available in most markets globally and sold by LinkedIn sales representatives through an annual or quarterly subscription. You must have a minimum level for your budget or a recommended minimum of 20,000 monthly unique visitors to your website. Currently, it’s only available in English but will be expanded to other languages over time. To achieve success, B2B marketers must employ tactics that impact the entire funnel, from reach to acquisition. The tools and methods cited above can contribute to your comprehensive marketing strategy, but they’re flexible—meaning that there’s no such thing as top-funnel-only or bottom-funnel-only strategies. Online display advertising, for instance, has proved effective across the board, according to a recent Harvard Business School study. Similarly, content marketing is a full-funnel tactic, where blog articles can establish your brand as a thought leader, while white papers and product-focused content can educate prospects and drive leads. Rather than approach this in terms of upper and lower, focus on understanding the objectives you want to meet at each stage. From there, identify the right metrics and then execute the most effective strategy to achieve them.